(Buzz60/Josh King) -- Airport Security tests everyone's patience but now maybe you could get a pat-down even before entering the terminal. In the wake of recent terrorist attacks at airports in Brussels and Istanbul, some U.S. government agencies have begun discussing expanding security parameters. A new layer of security could be initiated with the idea of moving security checkpoints outside of the airports. 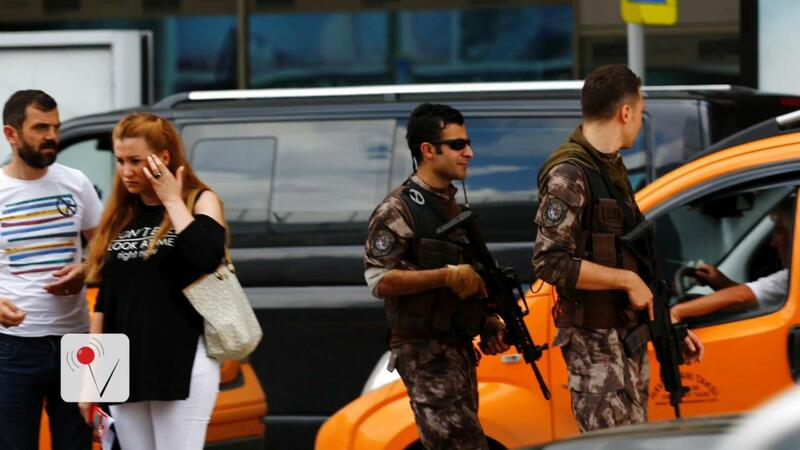 Istanbul had placed armed officers at the airports entrance which disrupted the three bombers plans, forcing them to split up. It's believed the death toll would have been much higher had the external forces not been present. The concept of moving the checkpoints outside to the curb or inspecting cars as they enter the airports could prevent terrorists from making it inside. Aviation security expert Denny Kelly says it would be expensive and inconvenient. "People are going to be late for their flights and miss their flights." He also went on to say the outside system won't work "because if someone is willing to give up their life, you're not gonna stop them by putting a mirror under their car." Kelly says the idea is unlikely to every become a reality. A Newark (EWR) traveler attempted to take their hoe on the plane. If you need to travel with your gardening hoe, it’ll have to go in your checked bag. This ornate flask of black powder was discovered in a carry-on bag at Allentown (ABE). While it is a fancy flask, the black powder contained within is an explosive and is strictly prohibited in both carry-on and checked bags. #TSAGoodCatch - This knife was discovered concealed in a bottle of pills at the San Francisco International Airport (SFO). Concealed knives can lead to fines and arrest. Please pack them in your checked bag. #TSAGoodCatch - This cane sword was detected recently in a passenger’s carry-on property at Las Vegas (LAS). All knives and swords are prohibited in carry-on bags, and concealed items can lead to arrest and fines. #TSAGoodCatch - This push dagger was discovered in a package of gum at the Detroit Metropolitan Airport (DTW). Knives are always prohibited from carry-on bags, but concealed knives can lead to fines and arrest. #TSAGoodCatch - Another #Batarang was discovered in a carry-on bag. This time it was at the Chicago O'Hare International Airport (ORD). Next time, leave your batarang in the bat cave, #Batman! #TSAGoodCatch - A throwing star was discovered in a carved-out compartment in a wooden cellphone case at Ontario (ONT) in a carry-on bag. Concealed items can lead to fines and arrest. #TSAGoodCatch - These neon green faux blood adorned machetes and throwing knives were discovered in a carry-on bag at the Portland International Airport (PDX). While machetes and throwing knives are prohibited in carry-on bags, they may be packed in checked baggage that goes in the luggage hold under the plane. #TBT April, 2014 - An 8.5” knife was discovered inside an enchilada at the Sonoma County Airport (STS). While this was a great catch, the passenger’s intent was delicious, not malicious, and she was cleared for travel. It’s always important to double check your bags and enchiladas. #TSAGoodCatch - These nunchucks were discovered in a traveler’s carry-on bag at the Newark Liberty International Airport (EWR). Nunchucks are prohibited from being transported in carry-on bags, but may be packed in checked bags as long as they’re not illegal where you are traveling. #TSAGoodCatch - This key knife was discovered at the Erie International Airport (ERI). All knives are prohibited from carry-on bags. Concealed knives can lead to arrests and fines. #TBT December 2013 - This loaded 9mm was discovered in a shoe inside a carry-on bag at the Grand Junction Regional Airport (GJT). This is one of the 1,813 firearms that were discovered in carry-on bags in 2013. 1,477 of those were loaded. While firearms are prohibited in carry-on bags, you can pack them in your checked baggage, as long as you meet the packing guidelines: bit.ly/travelingwithfirearms.